This year I decided Nana was going to have to make it on its own. 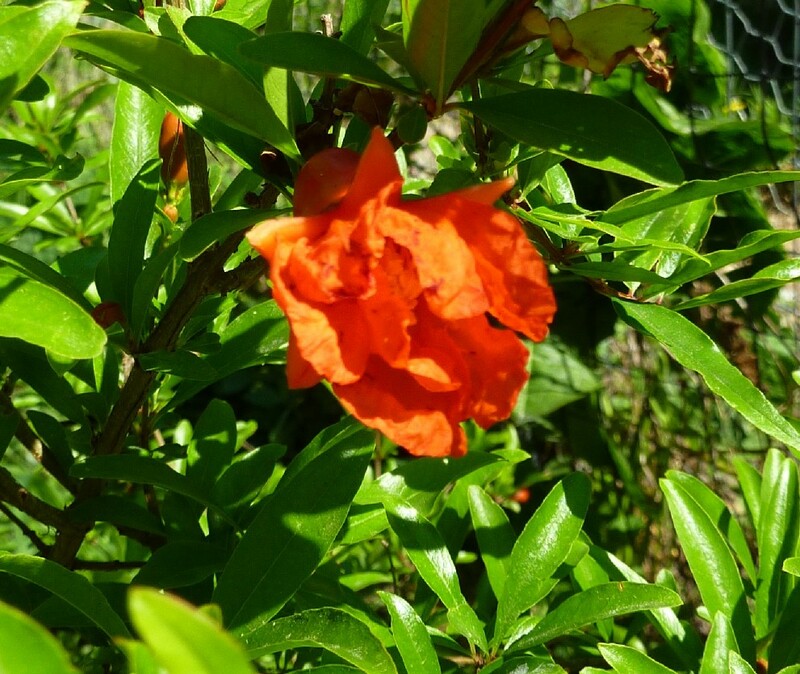 Most sources list pomegranates as being hardy to zone 7 with protection – more 7b than 7a, I suspect, but close enough. So I chose a quiet, sunny spot in my vegetable garden and planted it. I think it likes the new situation, no? That blurry thing in the photo is a fruit, which I hope will continue to grow and eventually ripen. ‘Nana’ is actually a nice small shrub to have just for the flowers and foliage (except the indoor deciduous bit), but fruits, even if small and infrequent, will make it even more special. Now, if I can get it to survive the winter… a little fence, some insulating leaves to stuff around it, a blanket or some row cover when it gets really cold… we’ll see. 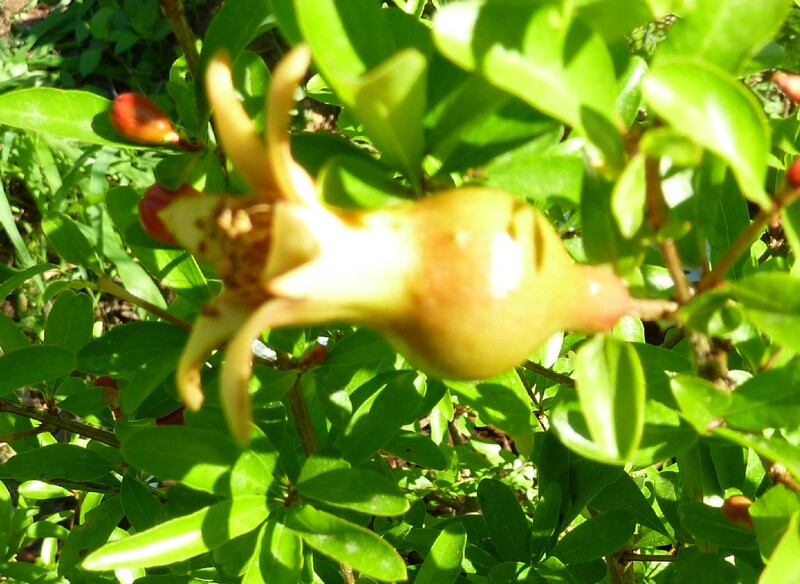 I’ve seen full-size pomegranates thriving at Colonial Williamsburg, and I think survival further north is feasible, but if anyone has experience growing this plant outside in zone 7a/6b or cooler, I’d love to be reassured. 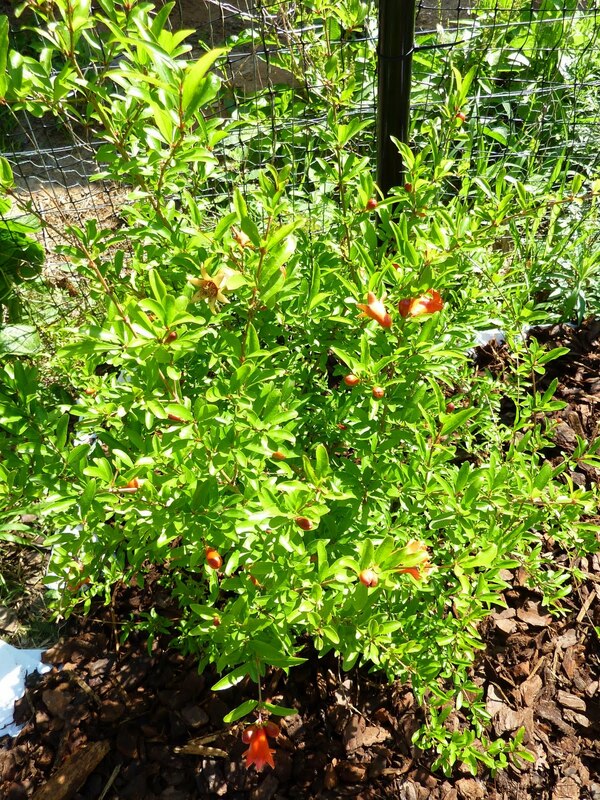 Shrub in place: currently about two feet tall, could put on an extra foot if it lives. Aside from that excitement, this has been Blueberry Extravaganza Week: blueberry muffins, blueberry soup, and plenty into the freezer for later. Blueberry pie for Fathers’ Day is a must! While we’re talking dessert, this is my favorite pomegranate recipe. Two ingredients: melted chocolate and pomegranate seeds (arils). Explodes deliciously in the mouth (and on the carpet, if you’re not careful). ← Tomato Patch: Setback or disaster? My neighbor in Columbia, MD has a big pomegranate tree for years. It does bear fruits. I have tried several varieties outside on the south side of my house for years. Someone told me that 'Angel Red' is damaged at anything below 18 degrees, which we absolutely get several times over the winter. It dies almost completely back to the ground. Winter 2013 was mild and I actually got a few small fruits that fall. It's always a guessing game when it comes to hold cold it will be. If you're in Maryland and want a sight to see, head to Smith Island while it is still above sea level (disappearing quickly). They have pomegranates that have survived and fruited there for years. People use them for decoration or jams because they are VERY tart there. Thanks, Brian. The plant did die after a couple of years in the ground – I think my location is just a little too cold.